This image is of the ceiling medallion in the Glen Mary Plantation in Sparta, GA. The center acanthus leaves were supplied by David Flaherty and the plaster walls are still being restored. The morning glory trellis model was produced in a single pie shaped section, molded and cast at Christopher Smith's studio. The medallion was installed and acanthus leaves applied by Greg Jacobs and Landmark Preservation LLC of Savannah, GA. This image shows the trellis border in the process of installation. It travels around the outer perimeter of the ceiling of the Glen Mary Plantation in Sparta, GA. The center acanthus leaves have been applied and the sky color has been applied to the background. This is the finished ceiling. The ornament was sculpted, molded, and cast by Christopher Smith. It was installed, paint, and gilded by Greg Jacobs and Landmark Preservation LLC of Savannah, GA. 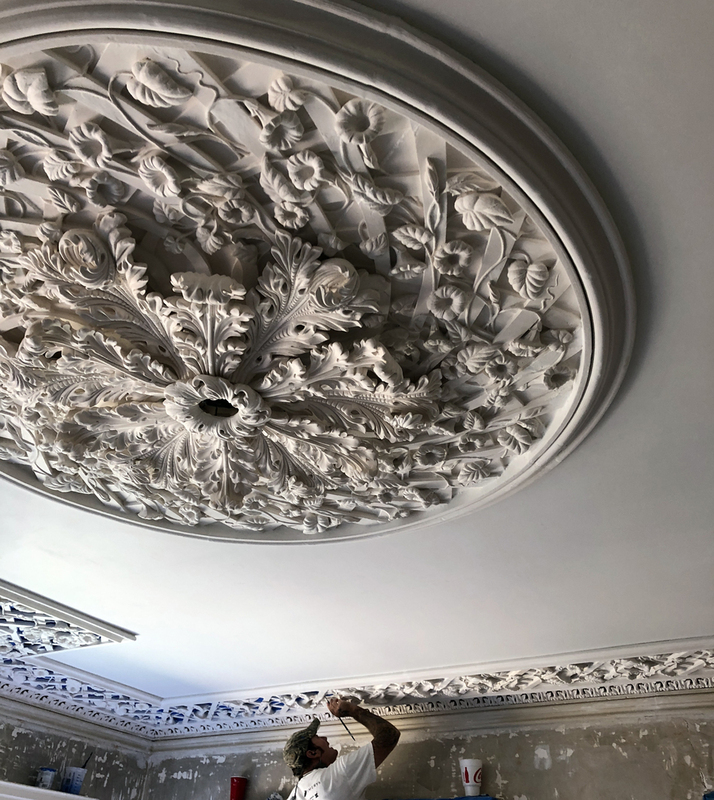 This is the finished ceiling medallion at the Glen Mary plantation in Sparta, GA.